The latest and greatest ambilight clone, the Adalight, comes from the fruitful mind and cluttered workbench of the sometimes Hack A Day contributor [Phil Burgess]. We’ve seen a few clones of the Philips ambilight tech, but [Phil] knocked this one out of the park. 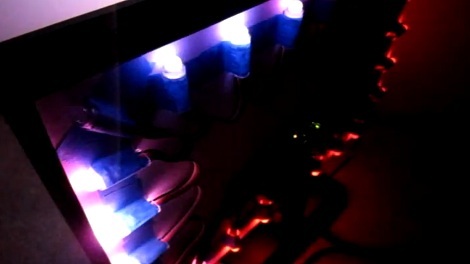 The hardware is a string of 12mm RGB LEDs connected to the Arduino of your choosing. After attaching the LEDs to the rear of the TV using anything from, “laser-cut acrylic to nothing more than a pizza box,” it’s on to the software. The Processing sketch performs a series of screen captures and averages the pixels around the perimeter of the screen. Reportedly, Carl Sagan’s Cosmos looks fantastic with the Adalight but there might be a better option. [Phil] used 25 LEDs on his Adalight, more than the usual 6-10 we see on other Ambilight clones. Check out the video after the break to see the Adalight in action. Ambilight systems are quite awesome. But I am not a huge fan of using a computer to update the LEDs. It should be possible to grab the video frame using the Video Experiment shield (if you get HDMI and NTSC/PAL output at the same time from the source). My popcorn hours does that. Then handle everything on the Arduino itself. I’ve looked into off-the-shelf dev boards that have an FPGA and HDMI passthrough and so far the only ones I’ve found are in the hundreds (or thousands) of dollars and not what I’m looking for. I think without HDCP there would already be such devices to choose from – FPGA or not. I got somewhat excited when the NeTV was introduced but that doesn’t cut it either because it just injects encrypted video overlay to encrypted HDCP signal. No usable holes in the licencing. There’s no way around HDCP if you want such device to be available to others. I don’t know the licencing prices but I’d guess it’s not “consumer friendly” at all. that1guy’s comment also suggest that. HDCP decryption using leaked keys would certainly be possible but if you produce such rogue device, you don’t tell anyone. Decrypting copy protection to get pixel information for additional lighting is against humanity and the death penalty will ensue. You don’t rob poor defenseless industrialists. HDCP is a non-issue here. If a content stream requires HDCP capability and that requirement is not met, the video stream is -not- denied. What you get instead is a lower resolution video stream (480P, I believe). … and unless you have hundreds of LEDs on your Adalight, even 480P is massive overkill. The image in the tutorial demonstrates this… each pixel “family” along the edge of the video is going to contain thousands of pixels. You could quite literally get the same accuracy using one -field- of a NTSC signal. A composite video feed will give you the same quality and performance as HDMI. Remember, the TV does not know what you are feeding into the dedicated “LED controller”, so it does not matter if the device sees failed HTML down-resolution, composite, etc. If you actually cared to read, my comment (and this reply tree) has nothing to do with Adalight. I read your comment, and all the ones proceeding yours. The sub-topic that was developing was standalone parsing of HDMI. If you were veering off-topic, don’t be discourteous if people assume you were still on-topic… that compounds the your etiquette. This site has a “be nice” policy. Well then, I apologise for assuming that degenerated 540p on a full-hd television would be an issue on a commercial product and thought you were answering to the wrong reply tree. My bad. Now I noticed it. You said HDCP is a non-issue when you answered to the original comment but my comment was for Diego’s reply. I completely forgot that HaD comment tree doesn’t follow the conversation correctly, just few levels. Is it possible to pull the circuit from a computer monitor that accepts HDMI or DVI that decodes the signal and use that to interface with a micro-controller? great, now that HaD featured it the 7 that were available ysterday will be sold out before I get paid tomorrow! I can source 50pcs strands of those WS2801 12mms for 50$ if you are interested. Shipping to wherever its needed. Too bad the software requires quite a lot of CPU time. I use a laptop and was considering this for my external monitor, but its performance limits me. It’s much more efficient than the processing application… and it has a few more bells and whistles which is always fun! Just some feedback — you are embedding Vimeo wrong. 2) Press ‘Embed’. Put that in your tutorial’s content area instead of the SWF link. While this is very nicely done, I just don’t see the point of Ambilight in the first place. It seems hugely distracting from the picture in my opinion. I’d rather just watch the TV without it. As that1guy alluded to, it may be easier on the eyes because it provides more consistent lighting. It might be because I have a small 42″ flatscreen TV, but I can’t watch it if the room is pitch black. I need some kind of ambient lighting (even if it’s just a night light). Otherwise my eyes keep adjusting to the bright screen and the dark room and it ends up feeling too bright. (Yes, I know I can probably dim the TV brightness manually, but I never remember to do that, and can’t find the button on the universal remote). I don’t quite get the need to use processing, I had used some processing code initially for my ambientlights and it used way more resources than it should of, and also ran rather slow. Boblight supports as many channels as you want, and I take it the lights used in this project are individually addressable. I might look into the individually addressable lights which are cool, but 4 channel rgb strips are pretty enjoyable to me right now. Might be neat to use both. I agree with the others though that a device that does HDMI passthrew would be ideal. I’ve never seen an Ambilight so I’m not sure how it is supposed to look/work, but the *only* way I can see it having any effect is when the bezel disappears and the image fades completely into the background. I wonder how it would look if you used the complementary color instead of the same as the one on the screen. For music that might spice it up, or not? I have a 100″ Infocus XScreen projector screen that would be perfect to do a project like this, but that’s something like 26 linear feet around the screen to fill with leds. Ouch $$$. Plus relying on the computer to crunch dose not sound fun. But at least there is a mac version! Thats so cool. We are trying to build such an ambilight box ourselves and create a really simple tutorial for everyone to rebuild it from scratch.